In Part 1, we talked about why coordination was needed? 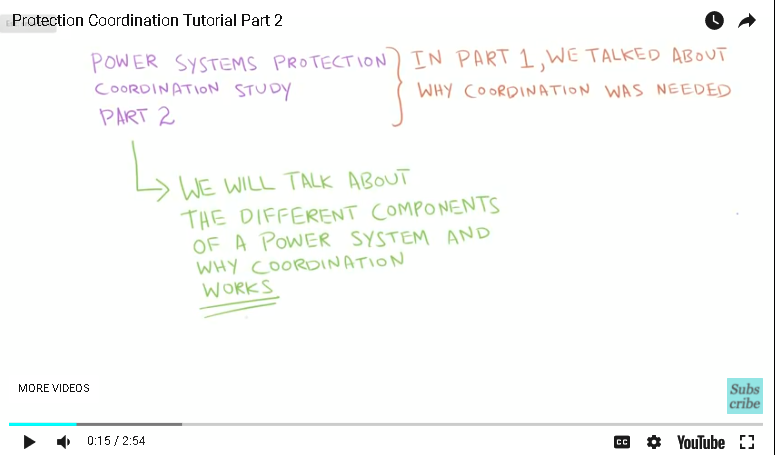 In Part 2, we will talk about the different components of a power system and the reason why coordination works. In this facility, we have a utility source generating power at 13.8 KV which is feeding a 1 MVA transformer. The transformer then steps the voltage down to 4.16 kV which feeds a downstream 4.16 KV bus. There is also a 100 Ampere breaker which we will name “Breaker A”. There is another 4.16 KV emergency generator, which feeds the 4.16 KV bus through a tie breaker. We also have a few medium voltage motors connected to the 4.16 KV bus through feeder breakers. Additionally, we have a 20 Amp fuse which is serving as a feeder. This fuse is feeding a 100 KVA transformer which steps the voltage down further from 4.16 KV to 480 volts. We also have a 120 Amp breaker which we’ll name “Breaker B” which is connected to a 480 volt bus. This 480 volt bus is feeding a low voltage motor through a third breaker which we will call “Breaker C”. Before we talk about intricacies of how coordination is actually performed, let’s first understand the general structure of this power system. Under normal operating conditions, the tie breaker connected to the generator bus would be open and interlocked as the system is powered by the utility bus through the utility transformer. If we look at the sizing of each breakers, we can clearly see that the highest rated breakers are connected to the upstream 13.8 KV bus. The second highest rated breakers are connected to the 4.16 KV buses. And the third highest rated breakers are connected to the 480 volt bus. 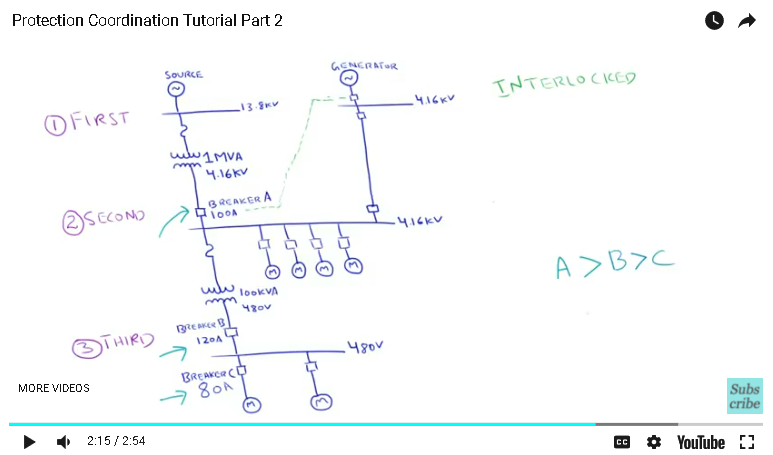 Intuitively speaking, we should typically expect upstream breakers to be greater than the downstream breaker for which we’d like to coordinate with. If Breaker C is sized at 80 Amps, then then we should expect Breaker B to be greater than 80A… As expected, Breaker B is rated at 120 Amps in our example. And if we consider Breaker A which has a rating of 100 Amps at 4.16 KV, then breaker B should typically be sized smaller. Again, Breaker B is rated for 120 Amps at 480V. 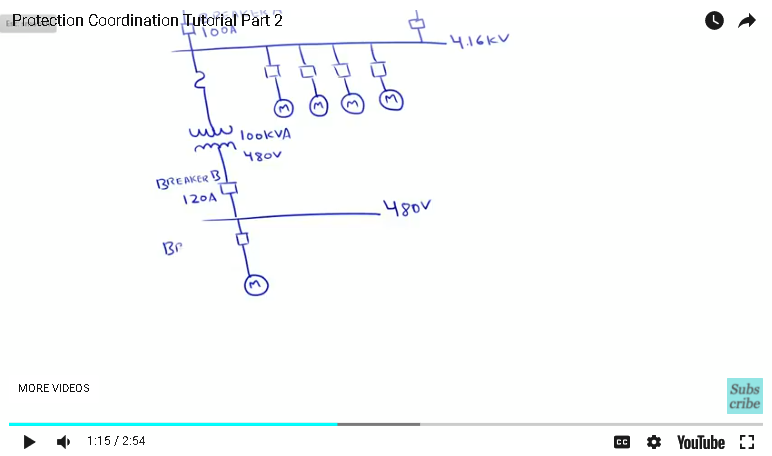 If we compare both breaker ratings at a common voltage, the difference is much greater. So to summarize it all, as a rule of thumb, we should typically expect breakers sized in reference to their downstream or upstream breakers. In part 3, we shall talk about the goals and strategies of protective device co-ordination.